We started chopping corn a couple days ago. I will try to post some pictures of that when we get done. We are also wrapping our bunker walls for the first time. The plastic is along the wall, and flipped over to the other side, when it is full, we will pull the two sides back over the top. 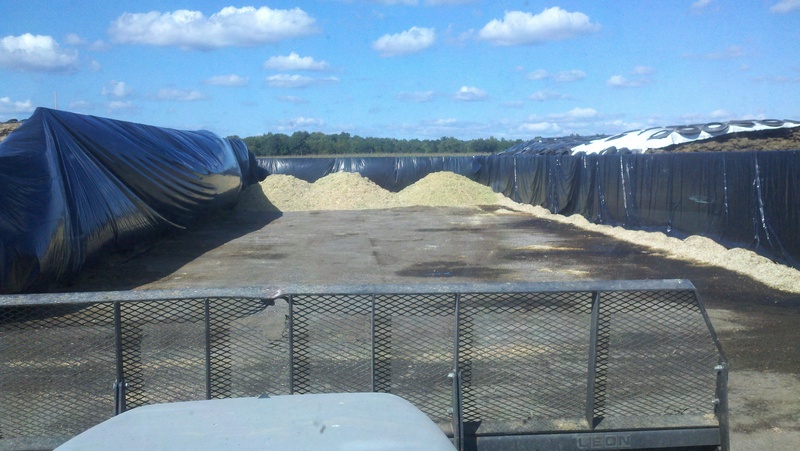 Here is a picture showing the plastic and the first couple loads of Corn Silage 2011. So with corn silage, fall harvest has begun for us. We will be pretty busy for the next month and a half or so! Lots of long days, but it is my favorite time of the year on the farm! This entry was posted in Agronomy, General Information, Machinery and tagged agronomy, bunker silo, chopping corn, corn, corn silage, crops, dairy farming, family farming, modering farming, production agriculture. Bookmark the permalink.